While the permutations up and down the leagues might have made for a head-scratching week all round, there was no doubt about Cavan's fate as they experienced relegation for the second time in three years from the top flight. Nothing short of a freak miracle would have preserved their top-flight status in their first year under Mickey Graham, who had already exhausted his miracle tally with a Leinster club title in his second job, as manager of Longford's Mullinalaghta. The Breffni men were at home for the visit of Dublin, stinging from last week's defeat to Tyrone and - for the first time of Jim Gavin's seven-year stretch - with no chance of reaching the league final. The Dubs jumped into an early lead of 0-8 to 0-4 before Cavan landed a goal from Martin Reilly. 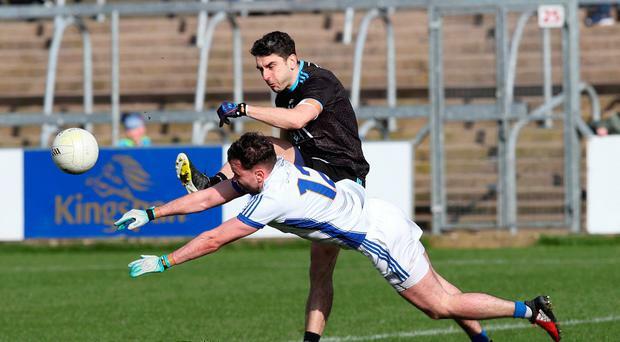 However, Dublin resumed control soon after and played the game largely on their own terms as they sailed to 1-16 to 1-10 win, in the process giving a few of their veterans such as Paul Flynn and Michael Darragh Macauley gametime. Monaghan will get a sixth consecutive season in the top flight. They lost by three points to Mayo, 1-18 to 3-15 the scoreline in Castlebar. However, Roscommon's defeat to Kerry has the Connacht side once again joining Cavan in jumping between Divisions One and Two. In Division Two, Donegal leap-frogged Fermanagh to claim second spot and go straight back up after their relegation in controversial circumstances last year. They ended the seven regulation games with 112 points scored for, which annihilates Fermanagh's 69 - the lowest of any team across all four leagues. By half-time they already had the game in the bag and with Gaoth Dobhair players Dáire ÓBaoill and Neil McGee featuring, they will emerge as a serious threat for an Ulster title. The game in Ballyshannon finished 1-20 to 0-10. In Division Three, Down have not made it back up, following defeat to Louth. The game between Louth and Westmeath that was called off last weekend due to weather conditions will now have to be played to determine which of the two Leinster counties join Laois in the second tier in 2020. Carlow and Sligo are the two sides who drop into the bottom division, the Barrowsiders falling to Laois by three points on the final day, while Sligo never even gained a single league point under the new management of former player Paul Taylor in a dismal campaign. Derry's game against Wexford was played on Saturday as it had no bearing on the overall effect of the league tables, themselves and Leitrim having already secured promotion after just five games played. Across the four divisions they finished up with the most dangerous attack with 130 points scored for. The game was played in Bellaghy and Derry treated their fans to a 3-21 scoring blitz. Their three goals all arrived in the first half from Benny Heron, Enda Lynn and Ryan Dougan. Antrim footballers had nothing left to play for but pride, but they reversed a five point deficit at half-time against Limerick in Newcastle west to win by four, 2-12 to 1-11. Ryan Murray and Matthew Fitzpatrick struck for second half goals to lead them in the driving seat and overall, three wins from seven matches along with some close-run things begins to look like not a sensational season for Lenny Harbinson's men, but not as bad as threatened. Add in that they had the meanest defence in the league with only 87 points conceded. The final pairings for next week's activity in Croke Park has been determined. On Saturday, Derry and Leitrim face each other with a 3pm throw-in. Meath and Donegal are playing after that at 5pm. Yesterday's activities begin with Limerick and Waterford facing each other in the Division One hurling league final at 2pm, while the headline act for the weekend is the Division One football final between Kerry and Mayo, a match that ended with a Mayo win the weekend before last in a windswept Castlebar. By John Campbell Down skipper Darren O'Hagan does not have to travel too far to seek inspiration as he prepares to lead his county into the Ulster senior football championship.